Dimes is a little slice of happy, healthy, heaven in Chinatown founded by friends Sabrina de Sousa and Alissa Wagner in September of 2013. Dimes specializes in seasonal organic food that’s good for your mind and bod, as well as a housemade line of 100% organic apothecary products including lip balm, rosewater spray, and salt scrub. Stay tuned to fwx.com each Monday for a new tasty and filling bowl recipe. I cook for a living, but I am often too tired to cook when I get home, so my fridge is usually a barren wasteland containing bits and pieces from leftover recipe tests, Frank’s Hot Sauce and garlic-chile paste. When I’m too lazy to walk to Dimes to eat, it can become a real situation. As a form of survival, I’ve created a game called “What can I invent from the contents of my fridge.” Not a catchy name—I’ll have to work on that—but it’s really fun to play. It recently led to buckwheat hotcakes with stewed pears, sour cream, maple syrup and Dimes carob granola. My boyfriend thought he had nothing in his fridge that time. Boy, was he mistaken. (Hi, Graham!) This next recipe came from one of the most successful rounds of the game. The original recipe was much less cohesive and had a more random array of ingredients, but the basic form was born and has been tweaked into a real recipe since then. This one works great for breakfast or lunch. Salty, spicy, sweet and crunchy, it’s one of my favorites. 1. Bring water to a boil and stir in rice. Cover, reduce heat and simmer until water is absorbed, about 30 minutes. Remove from heat and let sit, covered, 10 minutes more. Transfer to sheet pan to cool, spreading out in a thin layer. 2. Heat 1 1/2 tablespoons vegetable oil in a medium skillet. Add eggplant and cook until browned and soft. Season with kosher salt to taste. 3. Heat remaining 1 1/2 tablespoons vegetable oil in another medium skillet. Add garlic and sauté until fragrant. Add broccolini and cook until just tender. Add collard greens and cook until just wilted, about 1-2 minutes more. Stir in eggplant and red pepper flakes. Divide vegetables between four bowls. 4. Wet hands with cool water and form rice into 4 firmly packed balls. 5. Heat remaining 2 tablespoons oil in a large nonstick skillet until very hot. Fry rice balls until brown on each side. 6. Cook sunny-side up eggs: Heat butter in a large nonstick skillet over medium-high heat until butter begins to sizzle. Crack 4 eggs into pan, keeping yolks intact. Lower heat to medium-low and cook eggs until whites are set and yolks are firm. Season with salt and black pepper to taste. To serve: Place 1 rice ball on top of each dish of vegetables. Drizzle with tamari to taste. Place 1 egg on top of each rice ball. Garnish with black sesame seeds. 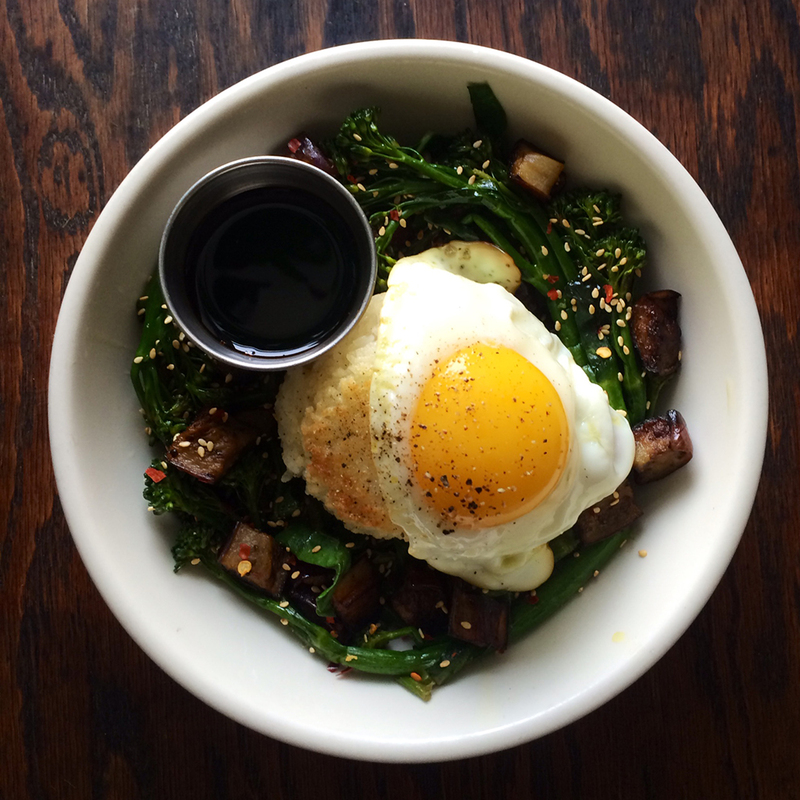 Follow Dimes on Instagram @dimestimes and stay tuned to fwx.com each Monday for a new bowl recipe.